Clint Eastwood as Joe Kidd in Joe Kidd (1972). Penned by Elmore Leonard, Joe Kidd is a unique revisionist Western starring Clint Eastwood as the titular ex-bounty hunter who finds himself reluctantly hired to join a posse tracking down a group of Mexican revolutionaries fighting for land reform. 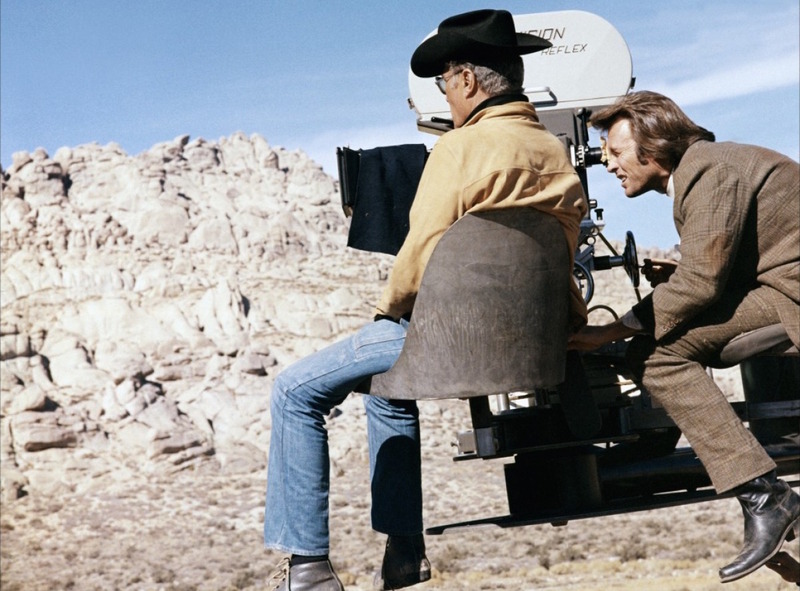 Although the Joe Kidd character could be interchanged with any of Eastwood’s usual taciturn and iron-willed Western heroes (not that he’s any less entertaining for it! ), the movie benefits from its interesting and oft-ignored setting and context as well as the usual Elmore Leonard touch of an array of unique characters populating the film’s world. Well the deer didn’t know where he was, and I wasn’t sure either. Audiences had become well-acquainted with the sight of Clint Eastwood’s familiar “Man With No Name” guise in Westerns, so it must have caught many audiences off-guard when Joe Kidd is first introduced in a suit – albeit, a raggedly worn one after his night in the slammer. Joe makes up for lost time after an entire two (2) days away from being with a woman. Joe’s three-piece suit is a muted brown plaid tweed. His single-breasted jacket has notch lapels that roll to the top of a 4-button front, which he leaves open (as he does with his vest beneath it). The jacket also has a welted breast pocket, flapped hip pockets, roped sleeveheads, 3-button cuffs, and a ventless back. Upon learning that bad guys are coming to the bar, Clint gets his priorities straight by checking the bar’s shotgun then pouring himself a cold one. The aforementioned vest has seven buttons, always left open. Were he to button the vest, it would have a notched bottom. Joe’s flat front suit trousers have belt loops, through which he wears a wide black leather belt. The trousers have frogmouth front pockets and a straight fit through the leg to a slight flare at the bottom over his boots. Brown tweed is the new black. Although he wears a belt, the brown leather straps from a pair of suspenders are also seen attached to his trousers. Joe’s shirt is striped in various widths in tan, white, and pale blue. He wears it with a white detachable collar that fastens in the front and back with gold studs. Joe meets with Frank Harlan and his cronies. His wide and short tie is a series of large red ornate dots on a navy ground. With no one to impress in jail, Joe lets his tie and collar fly free. Joe wears a pair of plain black leather riding boots with raised heels. A behind the scenes look of Clint getting a look at the scenes. Despite his boots, Joe isn’t yet ready to ride so he wears his “city hat”, a black felt derby with a black grosgrain ribbon. Joe Kidd sets a new standard for manliness. Joe misinterprets the meaning of “shotgunning a beer”, but no one has the courage to tell him. Actually, I take that back… this is what the meaning is now. 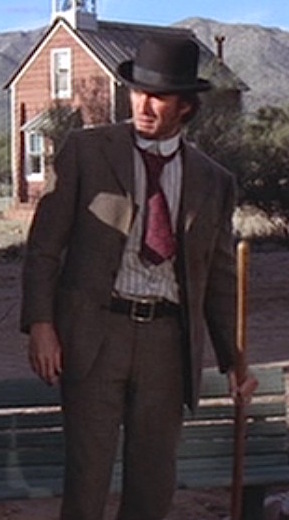 Not the traditional look associated with a Clint Eastwood Western role, Joe Kidd’s suit is worn with just as much contempt as you’d expect from such a character. Uh… he’s goin’ on a huntin’ trip. I’ll be back.